Robert (Bob) Orrin Carson of Fonthill, Ontario, passed peacefully from this earth on January 21, 2019, at the age of 89. Devoted husband to his wife Rosemary for more than 65 years. Beloved by his sons and daughters-in-law: Rob (Barbara), John (Paula), Tom (Lynda) and Orrin. “Papa” will be deeply missed by his 3 grandchildren Rebecca, Rachel and Tommy. Predeceased by his elder sister Mary Sampson and younger sister Margaret Stephen. Survived by his youngest sister Diane Casson and his brother-in-law Jack Evans (Sheryl). 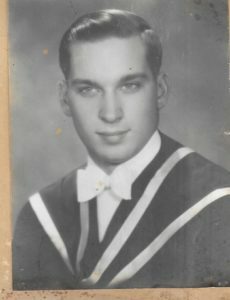 Bob graduated third in his class from Queen’s University, Kingston in 1951 with a Bachelor of Science in Metallurgical Engineering and obtained his Master of Science from Queen’s in 1952. He began his career in Metallurgy at Orenda Engines Ltd. in Downsview shortly after graduation and was then recruited by Bethlehem Steel in PA, USA in the late 1950’s. He returned to Canada and finished off his career with 25 years at Atlas Steel in Welland, being an integral part of their R&D department. Bob lived in Fonthill for the majority of his life, and many people knew him as a quiet man with a big heart. His friends knew him as a “stand-up guy”. Rest in peace, Bob, Dad, Papa. A private interment will take place in Kingston, Ontario with a celebration of life planned for a future date. If you would like to honour Bob’s life please, in lieu of flowers, give blood, donate to the Canadian Cancer Society or the charity of your choice. Our deepest condolences to Aunt Rosemary and family at the loss of our Uncle Bob. Love and our thoughts are with you. Orrin and family. So sorry for your loss. I hope the love of your family helps you through this most difficult time. Worked with Bob in Metallurgy for the last few years of his career at Atlas Steels. Never met a kinder and more classy gentleman. Taught me a great deal for which I will always be grateful. Deepest condolences to the Carson family and all his many friends. I will miss him a lot. He always protected me. Love to Rosemary and family. Our deepest condolences to your family. A pleasure of a man to meet. May you all find peace in the saddest of times. Our heartfelt condolences to the enrire Carson family. May your loving memories and close family connections aid you in this difficult time. We love you all very much! I grew up in Fonthill, both of my Brothers and myself friends with the Carson Boy’s. with great financial advice. As a young man i went to Atlas Steels looking for work. There i saw his parking spot ROC. That was Bob a Rock. A Great Person. Will be Sadly Missed.